I was nominated to fill out this award by the lovely La La Loves Chic blog today. 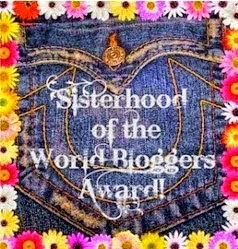 It's the sisterhood of the world bloggers award and I am really grateful to her for nominating me! La La Loves Chic - is a fab blog, beautifully designed and I simply adore her OOTD's. What is your favourite budget beauty product? It will have to be Revlon, I adore the colorstay range of foundations and find that they are really great for my dry skin. They come in a wealth of colours and I need to invest in more from Revlon to see if all of the line is as good as colorstay! What is your top tip for a brand new blogger setting up their very first blog? Blog for you, don't follow trends, do what you think people would be interested in. Make your blog your own part of the internet where you can write what you want! Ohh this is a tough one.. I love sweets, but I don't think I could go for long without some milk chocolate. You've won a blogger scratch card that entitles you to one item you would never dream of buying yourself, what would you choose? Ohh, It would have to be either an IMac computer or the Mulberry Cara bag which is a backpack and shoulder bag 'Here' soo expensive but I love it nonetheless. I adore Twitter, I love how instantaneous it is. No faffing around with Facebook for me. What was your very first blog post about? My first blog post was just a basic few sentences saying hello nothing much, but my eyebrows looked like two furry caterpillars in my first ever YouTube video! I had no idea about lighting or how bad I looked but if you want a laugh you can check both out 'Here' for the blog post and 'Here' for the video! Which do you prefer, summer or winter? I love summer because I hate being cold, but my wardrobe for summer isn't that great so I much prefer winter as I have a slight obsession with coats and I think I could have a different coat on every day of the week, so winter is definitely my favourite for that reason. My surrogate mum (as I like to call her) and best friend encouraged me to start my blog in December 2011, I didn't know what I was doing but she said to me that after many years of me following other peoples blogs and watching countless YouTubers I gave it a go. Without her pushing me I wouldn't be doing what I am today. Sadly since she passed away in October 2013 it has made me more determined to make this little part of the internet my home. I really enjoy blogging, it's hard work but I have made some fab friends though it and I love meeting new people at blogging events etc. I am pleased for every opportunity that I get through blogging. If you had to describe your style in 3 words, what would they be? What's the #1 most played song on your iPhone/iPod? What are you most proud of in relation to your blog? Where do you hope to see your blog in the future? What are you favourite TV shows at the moment? That's it from me for now... over to you ladies to answer my questions and don't forget to Tweet me with your replies!